Your destiny is just one text away. 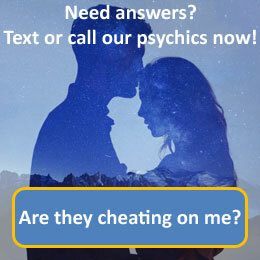 Try our new live text tarot and psychic service direct to your mobile phone. Got a question about love, money, relationships or work? Then send a text to one of our readers for a psychic text reading. It's easy to use, just text the word 67111 followed by your question to 67111 (text costs £1.50). You will get a free message response asking for your date of birth and name. Once we get this, the reader will attempt to answer your questions with the cards. When our psychics reply, you may receive up to 2 messages each time and will be charged £1.50 per message (1 Message = 160 Characters) Standard mobile network rates apply when sending in your question. Free promo texts may be sent. To opt out, text STOP to 67111. The first time you use the service you will be sent a free message asking you to confirm your first name and date of birth (over 18 only). If you need further information or have any questions, please contact our Customer Care Team on: 0161 7265432. Due to regulations, we are not allowed to comment on health, pregnancy, legal or financial related questions.